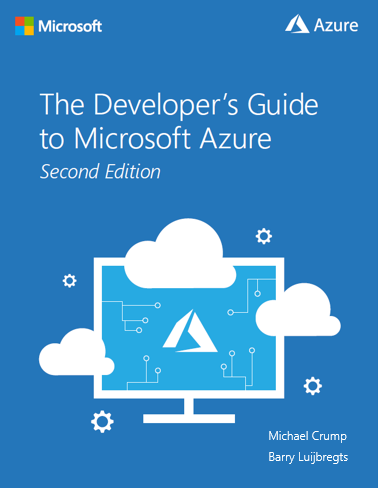 Today, we are pleased to introduce a free eBook titled, The Developer’s Guide to Microsoft Azure second edition. The book was written by Michael Crump and Barry Luijbregts to help you on your journey to the cloud, whether you’re just considering making the move, or you’ve already decided and are underway. This eBook was written by developers for developers. It is specifically meant to give you the fundamental knowledge of what Azure is all about, what it offers you and your organization, and how to take advantage of it all. FREE eBook available for download now! Barry and I have also taken into consideration topics asked by the community. We walk you through scenarios such as a tour of the Azure Portal and creating a virtual machine. We also discuss developing and deploying a web application that uses Node.js and MongoDB. We cover typical tasks such as CI/CD (Continuous Integrations and Continuous Deployment), staging environments, scaling, logging, and monitoring. We wrap up by creating a backend for your mobile application that includes authentication and offline synchronization. It is also worth noting that I have a downloadable PDF of the Cloud Service Map for AWS and Azure that allows you to quickly compare the cloud capabilities of Azure and AWS services in all categories. Thanks for reading and keep in mind that you can learn more about Azure by following our blog or on Twitter @Azure. You can also reach the author of this post on Twitter @mbcrump.